Tiny? Alaska contains more than twice the square miles of the second largest state (Texas) and represents over 40% of the shoreline in the entire United States. It contains the richest natural resources of any state. Out-of-the-way? Well, sure - it borders northern Canada and Russia. But it's not the least populous state. As of the last census it ranked 47th - outranking bellwether Vermont, and the home of the current Vice President: Wyoming. Oh, and the District of Columbia as well - guess that makes Washington DC even more out-of-the-way than Alaska. It's true that there is not a huge eligible voter population in Alaska - it's somewhere around a half-million souls. 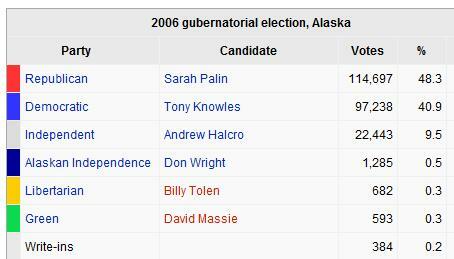 A plurality of those who voted for governor in 2006 voted for Sarah Palin. It's certain that we'll hear some gleeful prognostication that 114,697 votes in this 'tiny, out-of-the-way' state demonstrate little on this national stage. 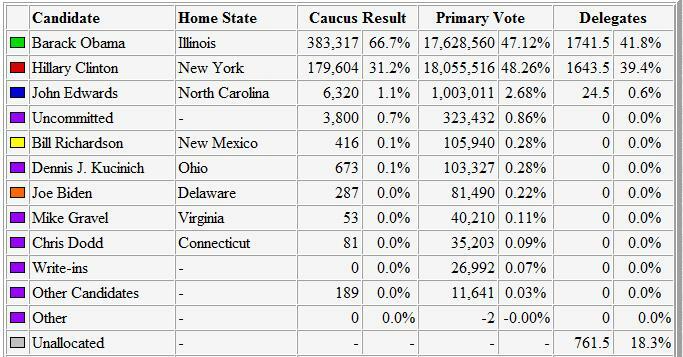 Joe Biden managed to secure 81,490 votes in the Democratic national primaries. He didn't even make a dent in his own home state. He managed to secure far less votes on the national stage than Sarah Palin did 'out-of-the-way'. You might claim that his is just odious comparison. Perhaps. But it does instruct us on the important issue of perspective. It's clear that Barack Obama suffers from such hubris (or fear?) that he failed to select the candidate for his running mate that secured more of the primary popular vote than he did (and who was done in by the urbanization of the Democratic party machine that she helped create) and instead chose a Washington insider who clearly has no chance of making a dent in national public office otherwise. So in the remarkable stealth dialogue that we now have in the public square, we have a product of the Chicago Democratic political machine and the quintessential Washington insider - remaking the failed promises of the nanny-state - cast as the 'agents of change' pitted against a war hero maverick with a nearly thirty year reputation of reaching across the aisle unafraid to bloody a few noses and a stud of a gun carrying soccer mom who isn't afraid to wade in among her own party in the public interest - and both with a keen interest to limit government - cast as 'more of the same'. How did we get so upside down? Oh, and Delaware is tiny too. Really tiny - about three tenths of one percent of the size of Alaska - and maybe 100,000 more eligible voters than Alaska has. Not as tiny as Rhode Island or the District of Columbia mind you. But small enough to elect Joe Biden. ...BS slinging of historic proportions. Mr. Obama, you say that the troops fight just as Americans - not as Blue state Americans or Red State Americans or independents - just Americans. But, if your vote had carried the day, Mr. Obama, they WOULDN'T BE FIGHTING AT ALL! You voted to leave them defenseless on the battlefield. That's called abandonment and that is what defines your character when it comes to those who would give their lives in defense of our country. That's what it means to lead a party who is united to end a war in the middle of the fight. I'm just now beginning to grok it. Obama is attempting to compete with the display at the Beijing Olympics. No, just a few firecrackers going off in a stadium. The race set before you is not one that is settled on an athletic field, this is not a game. It isn't to be one on the same old empty promises of the failed nanny state, the welfare state has failed and it cannot be resurrected as your gold medal. Should Barack Obama be elected President. How many times is it that we have been attacked by terrorists since 2001? How many times would we have been attacked had we followed your strategy of sitting back and doing nothing? 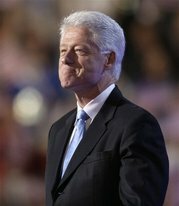 For reasons that we can only account to the badly damaged brain cells of public memory, we were treated to an attempt to gain support by association from a disbarred ex-president, whose key legacy is his acts of infidelity in the White House. Titular head of the Democratic Party? I must confess that I'm watching a good bit of the proceeds of the DNC. It really strikes me as one of the most dissonant characteristics of the perceived need to change Washington that Mr. Obama has selected one of the quintessential Washington insiders as his running mate. Mr. Obama looks more and more like Mr. Democratic Party Machine every day (not so different from those days in Chicago is it? ).